Want to look at more recent coverage of the Partition of India? The Library also subscribes to databases, such as Factiva and Nexis UK, that allow you to search and access the full text of a large number of UK and international newspapers from around the 1980s up to date. You can access these, the databases mentioned above and many other newspaper archives and magazine archives from Newspaper Databases. The Library has access to a large range of primary source databases that allow you to search for and view primary source archive material online. Archives Unbound presents topically-focused digital collections of historical documents. There are currently 265 collections in Archives Unbound covering a broad range of topics from the Middle Ages forward-from Witchcraft to World War II to 20th century political history. As Archives Unbound covers such a vast range of subjects and collections, searching through the whole database will provide material perhaps from some surprising areas (so it’s very worthwhile doing this), however, of particular interest may be the collections India from Crown Rule to Republic, 1945-1949: Records of the U.S. State Department and Pakistan from Crown Rule to Republic: Records of the U.S. Department of State, 1945-1949. Screenshot from ‘Pakistan from Crown Rule to Republic: Records of the U.S. Department of State, 1945-1949’ (Archives Unbound). 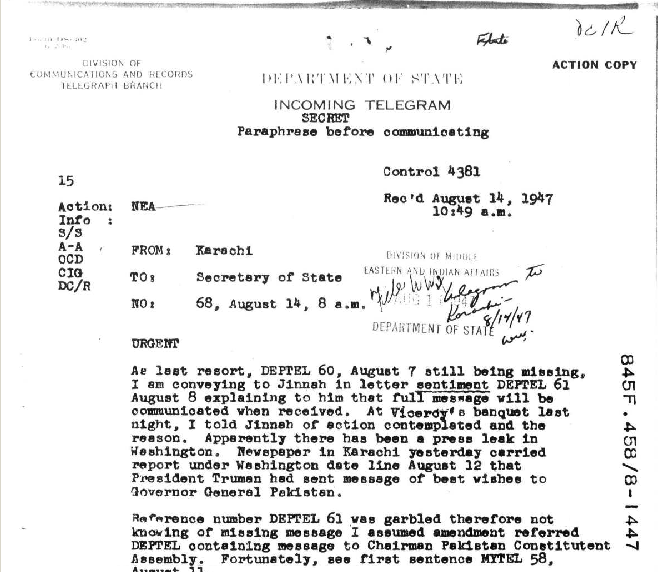 These two collections of U.S. State Department Central Classified Files relate to the internal affairs of India and Pakistan and U.S. relations with the two countries, containing a wide range of materials, including: reports on political and military affairs, studies and statistics on socioeconomic matters, interviews and minutes of meetings with foreign government officials, full texts of important letters, instructions, and cables sent and received by U.S. diplomatic personnel, etc. Note that there are other collections within Archives Unbound which look at events and periods of history related to India and Pakistan prior to and after the period 1945-1949, so it is worth a further investigation. Some other primary source databases you may want to have a look at include the Churchill Archive (includes more than 800,000 pages of original documents, produced between 1874 and 1965, ranging from Winston S. Churchill’s personal correspondence to his official exchanges with kings, presidents, politicians, and military leaders), Empire Online (spanning the last five centuries this resource brings together manuscript, printed and visual primary source materials for the study of ‘Empire’ and its theories, practices and consequences) and Documents on British Policy Overseas (a collection of primary source documents from Britain’s Foreign and Commonwealth Office (FCO), shedding light on diplomatic history throughout the 20th century). You can access these and a large range of other primary source resources from Primary source databases. What research has been done on the Partition of India already? You can use bibliographic (abstracting and indexing) databases to search for journal articles, book chapters, book reviews, conference reports, theses, etc. 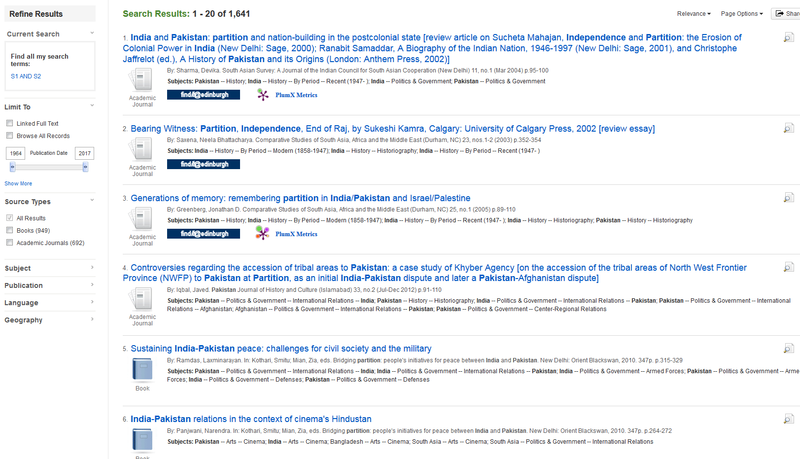 This enables you to find scholarly research on all events surrounding the Partition of India. The Bibliography of Asian Studies would be particularly useful for this area of research. Bibliography of Asian Studies is one of the most comprehensive western-language resource for research on Asia, containing nearly 900,000 records on all subjects (especially in the humanities and the social sciences) pertaining to East, Southeast and South Asia published worldwide from 1971 to the present. There are other bibliographic databases that would also be useful for this area of research e.g. Historical Abstracts, ATLA Religion Database, etc. Take a look at the databases listed under South Asian Studies and History for more information. Why not also search DiscoverEd to see what books, articles and other material you can find in the Library related to the Partition of India. The BBC has been showing a season of programmes related to the Partition of India, including documentaries and films. You can catch-up on these via Box of Broadcasts (BoB). Why not look for the 3-part Radio 4 programme Partition Voices, where Kavita Puri hears the remarkable first-hand accounts of those living in the UK now, who witnessed one of the most tumultuous events of the twentieth century. Academic Video Online provides access to 1000s of videos, including documentaries, interviews, performances, news programmes and newsreels, commercials, original and raw footage, and much more. On Academic Video Online you will find a number of documentaries looking at the Partition of India, including events leading up to it and the repercussions. 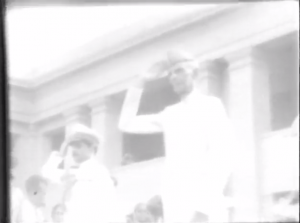 It also includes a few Universal Newsreels (these were shown in cinemas before films) from 1947 reporting on the Partition of India, including grainy footage from India and Pakistan. You can access these databases and others from Image and moving image databases. You may also be interested in looking at the newly released and freely available India on Film: 1899-1947 from the British Film Institute (BFI). This entry was posted in Library, Online resource, Primary sources and tagged 20th century, Databases, History, India, International Relations, newspapers, Pakistan, Politics, primary source by cstirling. Bookmark the permalink.